Well, apparently summer is officially over but we’ve had another pretty spectacular month on the English Riviera and plenty of families enjoying holidays with us. We’ve also had plenty of people raising money for us and, as always, being incredibly supportive of what we do at the THHN. Read all about what’s been going on and make sure you check you have all of our special dates are in your diary. We are very excited to be able to tell you all about our brand new hub in St Marychurch precinct. We’ll have some much-needed office space upstairs and then a shop downstairs. The shop will be selling pre-loved children and family goods, plus all of our lovely THHN branded bits and pieces, including clothes. We’re hoping it will be a very busy place and so are looking for lots of great things to sell. If you have any good quality items that you would like to donate please get in touch by e-mailing carolanne@thhn.co.uk who would be delighted to hear from you. We’re also looking for volunteers to help run the shop so, if you have a few spare hours and fancy giving it a go, please let us know. Our fabulous Memory Maker Caravan at the gorgeous Finklake Holiday Park has now been a THHN holiday home for a whole year. In that time 43 families have enjoyed special holidays there. What a fantastic resource it has been and it really has enabled us to not only provide extra holidays but to provide them pretty much all year round too. We can’t thank everyone involved enough, particularly our great friends at the Miss England Beauty Pageant for their incredibly generous donation. In September a family referred by Derriford Hospital in Plymouth, one referred by the Bath CLIC Sargent team and one from the Teenage Cancer Trust enjoyed holidays there. As many of you will know Luke was nominated for this award recently and, at a fantastic ceremony in September, Luke was announced as winner of this award. It was a great night with a room full of inspirational people with amazing stories and Luke was absolutely thrilled to receive this award. We’re very proud of him, and the work that the THHN does, so a huge thank you to everyone who voted and to Palm FM for a fabulous evening. Don’t forget about our 2014 Christmas Party. It’s October now and officially time for planning your Christmas celebrations! We’ve got a great night planned at the Palace Hotel in Torquay on Saturday 13 December. With a welcome drink, four course Christmas meal and disco until 1am it’s just £29.50 per person and, as far as we’re concerned, the more the merrier. If you’d like to come please either e-mail thhnchristmasparty@hotmail.com or phone Emily on 01803 316126 to book your place, we would love to see you! Cockington Caper Race Director, Matthew Day, who selected us to be the chosen charity for this year’s event. Claire’s Cakes, Save on Meats Torquay, Westcountry Fruit Sales, Riverford Torbay and South Hams, Halletts the Bakers and Torbay Family Butchers Ltd for all of their delicious hamper-fillers that they so generously give to our self-catering holidaymakers. The Rotary Club of Babbacombe and St Marychurch. Luke was delighted to be their guest at one of their meetings and was then presented with a cheque for £1368.67 which will be used for the THHN travel grant scheme. The Hotel De La Mer which this month welcomed a family referred by the Rainbow Trust Children’s Charity. The team who helped run our charity tombola at Sainsbury’s, St Marychurch, where we are this year’s chosen charity. Andy, Craig and Jelena who did a skydive for us raising an amazing £1036.34. Great effort guys. Vomero Holiday Apartments in Torquay who gave a family a much-needed holiday this month. 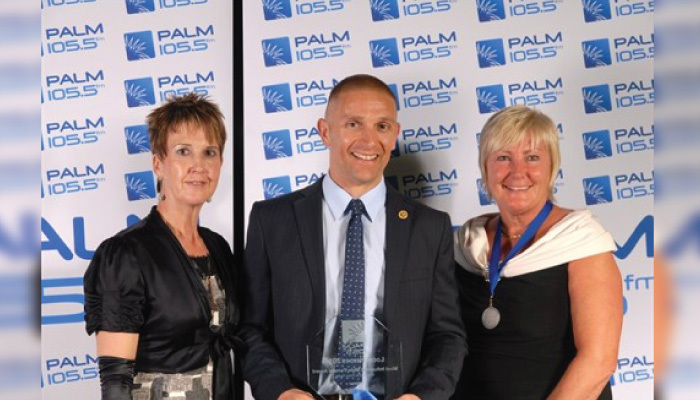 Andrew Park Photography for some great photos from the Palm Local Heroes Awards Night. Fabulous THHN fundraiser, Andy Medworth, who competed in the Dawlish triathlon for us. We’ve now got just over 2000 “Likes” on our Facebook page – how fantastic is that? With 962 Followers on Twitter we have a lot of people taking an interest in what we do via social media. This is a superb way for us to communicate and if you know anyone who might be interested in hearing about what we, and all of our supporters, get up to please invite them to “Like” us too.